This gift pack is the perfect present for that upcoming baby shower. 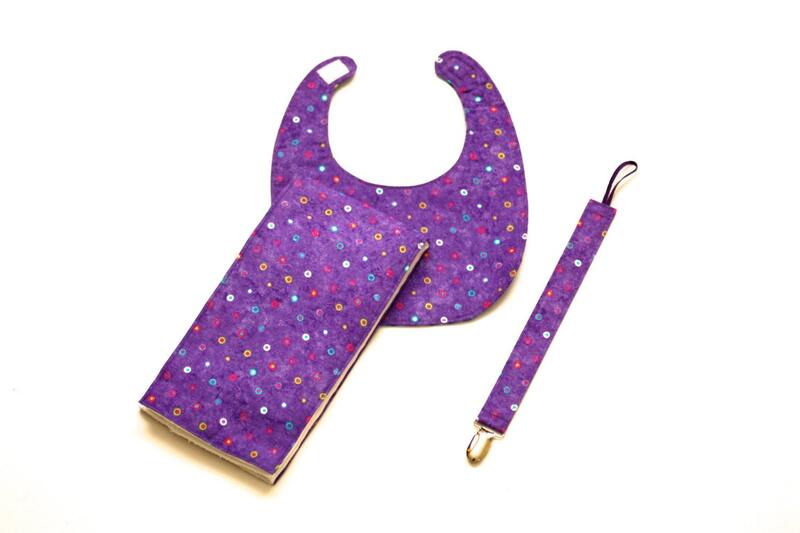 It combines a bib, burp cloth and pacifier leash in a matching design in purple. Care is easy. Just wash on a delicate cycle and air or tumble dry. All items from Childtime Creations are made in a smoke-free and pet-free environment. Policies Payment I accept Etsy Direct Check Out and PayPal payments for all purchases. Follow the prompts to complete your purchase and please don't hesitate to contact me if you need help. Payment must be made within 24 hours. I will attempt to contact a buyer if payment is not received within 24 hours, and I reserve the right to cancel a sale and re-list an item if payment is not received within 48 hours. Policies Shipping I ship items via USPS Priority Mail. Orders are shipped within two business days (or less) of receiving your payment. Shipping costs include the actual cost of shipping, plus a small amount to cover the shipping supplies. If you checkout through Etsy, I will use the address listed for your Etsy account to ship to. If you are sending this as a gift, I'm happy to ship to a different address! Please include this information in the Notes sections during checkout. At this time, we only offer shipping to US addresses. Policies Refunds I will accept returned items in unused condition within 30 days of purchase. Upon receiving the item, I will refund your purchase price and original shipping fee. Please note that I will not refund the price of return shipping. Additional Info All of my quilts are made in a smoke-free, pet- free home.